Classic, timeless design and unmatched quality of workmanship are the characteristics of the Challenger Line. This entry level professional Trumpet has a freeblowing, dark, warm and centered sound. The B&S 3137 Challenger I trumpet is 100% German-made and holds true to the brand’s 250-year-old tradition of making high quality brass instruments. 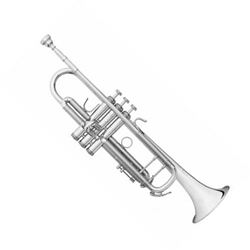 The 3137 is a professional Bb trumpet with classic and familiar ergonomic features. The 3137 features a very unique one-piece hand-hammered bell made in the traditional way using the knowledge of skilled master craftsmen at B&S who use hand-on techniques. This allows the trumpet to be full of rich colors and resonate freely with a wide array of characteristics. Excellent Response, precise intonation and a beautiful sound - B&S does everything to achieve those qualities. B&S Brass Instruments are developed in close cooperation with top level musicians and world class master craftsmen - a tradition that has spanned over 250 years.